1. NARS Concealer in Chantilly - full disclosure - I am always the lightest shade in any concealer - no. matter. what. I am THAT pale. Ok on to the product - a stick concealer is always in my arsenal because I tend to love the consistency and application. This texture is extremely thick and gives great coverage for mornings when you need an extra boost. 2. Maybelline Instant Age Rewind in Fair - This product has been talked about all over Youtube by so many bloggers that I had to pick one up to see all the hype. The foam top applicator is quite delightful to use and fits perfectly under my eye, while the texture is very creamy and almost cooling when applied. Formulated with ingredients to help actually FADE your dark circles and diminish fine lines - I just simply like the spongey top and find it cool to use - but bonus that it's doing some good for ma peepers. Best when used with liquid foundations (as has been my experience). 3. Burberry Sheer Luminous Concealer in Shade 1 - Stop the press because I LOVE this product. Fashioned after the famous Touche Eclat by YSL (which I will talk about next), it gives a great highlight under the eye but much more coverage than any other pen style concealers I have used. The shade range has expanded so there is simply no excuse for you not to have one! Now that I have found this, I will most definitely never let my makeup collection go without. 5. Miracle Skin Transformer Treat and Conceal in Light - Another one of those double duty products that will cosmetically help to hide your bags, while subsequently providing great treatment benefits such as hydration, diminished fine lines and fading of dark circles. Frankly - what sucked me in with this product was the actual texture of the concealer. A creamy, almost whipped-like texture with MIND-BLOWING coverage - this will not only hide your bags, it may make you forget you ever had them in the first place. And in a pinch - I will use this product on my cheeks, nose, forehead and chin as a foundation and it makes my skin look flawless. Two thumbs way up. 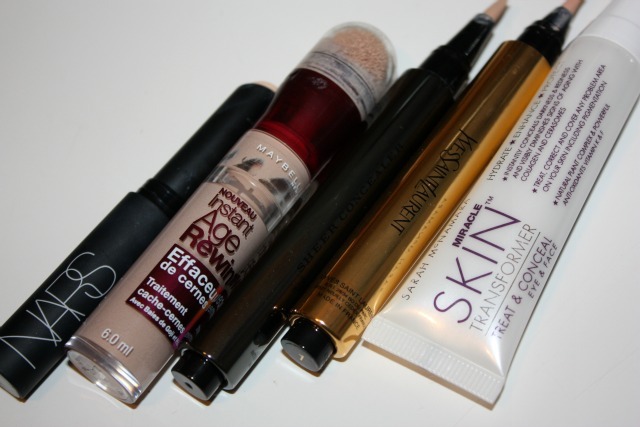 What concealers are you using and loving? Any I should try? Leave me a comment or tweet me @alittlebitetc. Thanks for the information!! I'm very intrigued by the Maybelline and YSL ones, will probably pick one of them up the next time I go shopping.